Going to the movies during the Melbourne International Comedy Festival can almost be considered sacrilege but Impro Melbourne have found a way to let the people have their cake and eat it too with At The Movies. Completely made up on the spot, the show is created from the first five minutes of a B-grade movie that no one in the cast has seen until that moment. Our "director" Sarah Kinsella provides us with the synopsis of two movies in which to choose from and based on an audience vote, the favourite is picked and we watch the opening scenes. In this instance, it is the 1985 film Desert Hearts, in which a New York professor divorces her husband and has an affair with another woman in Reno, 1959. 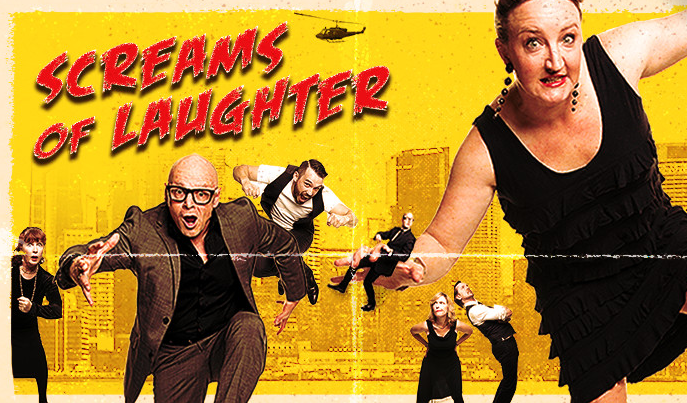 The performers - Brenna Dixon, Amanda Buckley, Adam McKenzie, Jason Geary and Nigel Sutton - are full of enthusiasm and have the "yes and" attitude that improvisers require. Seeing what they are capable of creating on the spot is always a joy to witness but part of the risk with impro is that it doesn't always work. While there are laughs to be had in this re-imagining of Desert Hearts, the story that took place on stage didn't acknowledge the main storyline of the film - the romance between the two women - with a number of scenes not adding to the narrative at all. As "director", Kinsella attempts to rein everyone back in but with little success. Part of this could be that there are too many external influences impacting how the story is told. With light cues, live music and live sound effects being created on stage, it seemed to be too overwhelming for the performers in being able to tell the story and subsequently became more focused on matching these elements when they were seen or heard. Just like impro can never repeated, it is unfair to base a whole season on one night's performance. The Impro Melbourne members are experts at what they do, and they do it brilliantly. Unfortunately this performance of At The Movies was not their best work, but they are definitely worth seeking out this festival, because they can - and will - only get better as the season progresses and become more comfortable with this format. Click here to read my interview with Sarah Kinsella.